IF you’re leaving Auckland, Christchurch…, consider property value loss as gift of life cost! Auckland and Christchurch homeowners are selling their properties for less than they paid for them, and the number has doubled over the past year, a report said. The numbers compared to 3.1 per cent loss in the same period of 2018 and 1.5 per cent at the end of 2016. The losses, when added to the real estate commission and other fees, can be as much as 30 per cent of the purchase value. [UPDATED on April 5] Between March 24 and April 4, at least 54 people were killed and more than three dozen others critically/seriously injured on NZ roads in two regions that are being monitored by our insiders. A homicide investigation has been launched following the discovery of the body of a man shortly before 10pm last night in the Waimakariri River bed near Harrs Road, North Canterbury, police said. Fatal ‘head-on’ collision in Whanganui involved only one car??? Police have once again changed their story a bout a fatal crash. They are now saying only one car was involved in the fatal [head-on] crash in Whanganui at the intersection of Anzac Parade and Duncan Street at 2.30am on Saturday 5th August. A man, aged 27, was killed in the crash. What are police trying to hide? Was the other vehicle a police car, or driven by a an important person they are trying to protect? At this stage Police believe this is an isolated incident and there are no safety concerns for the general public. At least one person was killed and two others are in hospital after their car crashed in Wellsford this afternoon. One person was killed in a crash on State Highway 63 in the Wairau Valley overnight. [Bay of Plenty of Deaths] A male motorcyclist was killed in a serious crash on SH1 between SH5 and Webster Road, near Tirau near the SH1 and SH5 intersection around 8.30pm on Saturday. “Two men entered the tavern on Trents Road at approximately 2am on Saturday July 15th. Saturday, July 15: No road fatality report allowed by police, today, as of posting, despite nine serious crashes that have been reported locally. “A vehicle fleeing police had its tyres spiked shortly before crashing into a power pole and catching fire in south Auckland. The collision, in the early hours of Saturday morning, also sent more than 1000 homes into darkness,” a report said. “The two occupants both got out of the vehicle immediately and soon after the vehicle caught on fire,” police said. 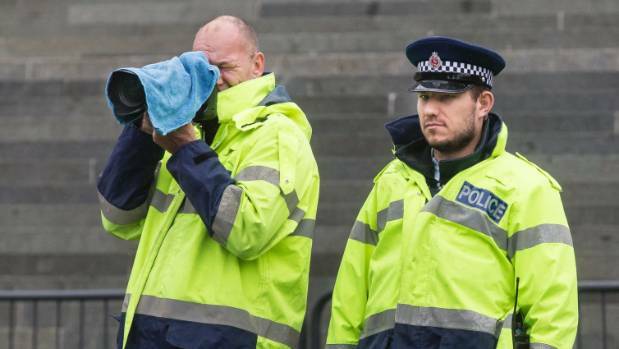 “Many people would want to know why they are taking photos,” said Green MP Gareth Hughes, who was at the protest organised by climate group 350 Aotearoa, adding that had never before seen police taking pictures of protesters at Parliament. “Human rights lawyer Michael Bott said there would be cause for concern if police were compiling Soviet-style electronic dossiers on protesters, which had the potential to erode the freedom to protest protected under the Bill of Rights Act,” said a report. Our Intrepid Sailors Show How It’s Done!! New Zealand suffered a spectacular capsize in their America’s Cup semi-final against Great Britain, said a report. 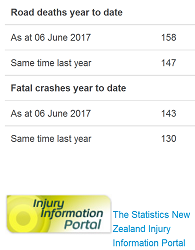 ONLY one road fatality report allowed by police today, as of posting. [Wednesday, 7 June 2017 – 6:15am – Canterbury] One person was killed in a single vehicle crash on Charteris Bay Road in Teddington, Canterbury, last night, police said. [Tuesday, 6 June 2017 – 8:53pm – Canterbury] The young woman who was killed in a two-vehicle crash on State Highway 1 near the junction with Barnetts Road in Waimate, at about 7.30pm on Monday 5 June 2017 was 21-year-old Rosie Ann Crozier [‘nationality not specified,] police said. One in five kids began showing signs of stress disorder, as dearly as four years ago! Which is the second happiest nation, with New Zealand topping the list? “The number of children and teenagers on Prozac-style anti-depressants has soared 98 per cent in the last 10 years to a total of nearly 15,000 young people last year. “Ministry of Health [most probably doctored] figures released to the Herald under the Official Information Act (OIA) showed 2163 children aged 13 or under collected a prescription of antidepressants known as Selective Serotonin Re-uptake Inhibitors (SSRIs) last year – an increase of 79.4 per cent since 2006. “The number of 14 to 18-year-olds who collected a prescription of SSRIs increased 101.9 per cent in the same timeframe to a total of 12,617 people last year. 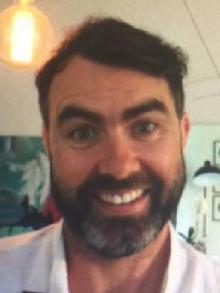 Tasman police have abandoned search for missing Swedish Hunter Hans Christian Tornmarck, 27. Mr Tornmarck went hunting by himself on Friday 12 May, 2017 and was due out of the bush 8 days ago. Number of police thugs caught speeding without an excuse jumped by about a third in the first three months of 2017. Authorities have not revealed how many of the offenders were DUI. “Police figures published on Thursday show 118 upheld speeding tickets were issued to police vehicles from January to March this year. “That is up from the 81 upheld tickets issued from October to December, and the 97 infringements recorded in the first three months of 2016. No vehicle related fatality reports allowed by police on Friday, as of posting, despite multiple serious crashes. Only two vehicle-related fatality reports allowed by police on Thursday, including a “carry over”, despite more than a dozen serious crashes. At least five foreigners have been killed in vehicle-related crashes in New Zealand over the past few days. 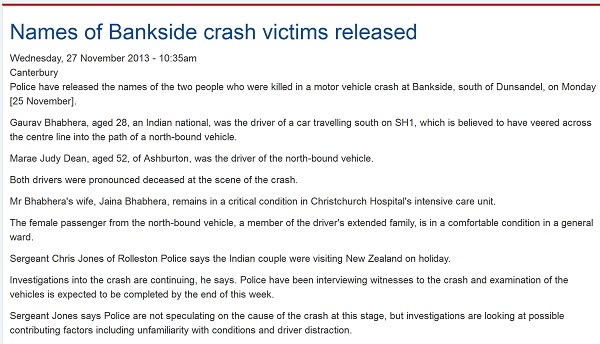 The fatalities include two Singapore nationals, two Samoans and one Aussie. 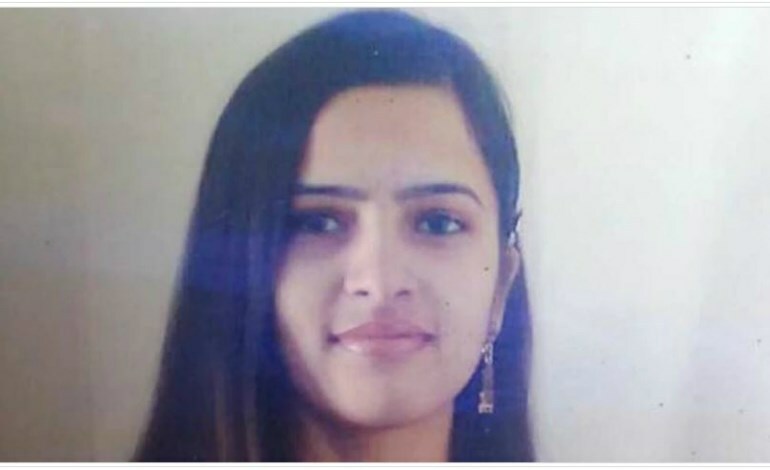 Gurpreet Kaur, 26, who was born in India, was found dead under “mysterious circumstances” at her workplace, a private IT company in Manurewa, South Auckland on Wednesday, May 10. Her employer reportedly found her body with injury marks on her neck and called the police. The body was sent for post-mortem and the case has now been referred to the coroner. Gurpreet was born in Punjab, India and married in 2014, “and her husband joined her in New Zealand only six months ago,” a report said. She lived with her husband and mother-in-law, who are “in a state of shock and unable to talk to anyone,” NZ Sikh Society has said. It’s unclear at this stage, whether her death is related to other IT workers found dead in New Zealand since last year. Coincidentally, she was the second Indian Woman called “Gurpreet Kaur” to be murdered [or found dead] in NZ in just over a year. A young, pregnant woman, also called “Gurpreet Kaur”, was murdered in April 2016. The 22-year-old victim was stabbed 20 times by her partner, a report said. A dozen or so cases reported over the past 48hrs. Police say they failed to arrest even a wanker. The man was seen masturbating on Dyers Pass Rd, but he outsmarted the police [the real ******, ] and fled in his car. 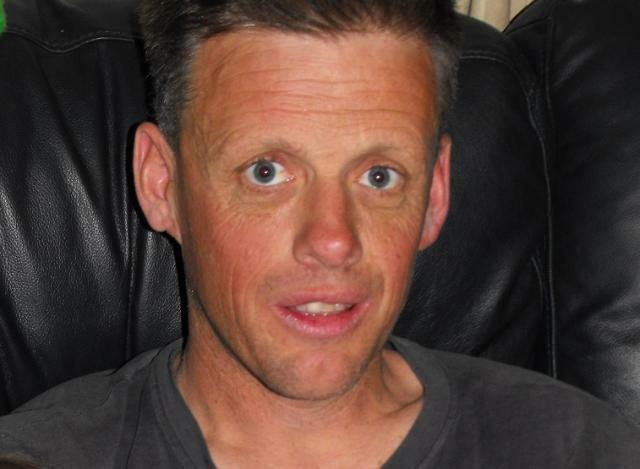 Lenard Malcolm Fowell died in Tauranga Hospital following a crash on the Te Puke Highway, Rangiuru last week. Where would NZ govt move to if catastrophic quakes razed Wellington, other cities? Magnitude 4.5 quake hit at 7:53:50 pm today, at a depth of 37km, about 10 km north-west of Blenheim, with 3,076 felt reports received from around the country, as of posting, according to Geonet website. No road fatality report allowed by police today (Saturday), as of posting, despite at least eight serious crashes that have been reported locally. ONLY four fatalities reports have been allowed since last Saturday’s quintuple road kills. What’s the best thing that could happen to New Zealand government? What are the alternatives for a seat of government, if catastrophic earthquakes hit Wellington, Auckland, Christchurch, and six to nine other cities, in a short period of time? “The cost of repairing Wellington after an earthquake similar in magnitude to the one that struck Christchurch in 2011 would be at least $26 billion,” according to a report jointly prepared by Deloitt and a dilettante engineering firm. What if the quake was two or more orders of magnitude larger than the 2011 Christchurch Earthquake? What if more than one mega quake razed Wellington and as many as nine other New Zealand cities within a short period of time? “My understanding is that if it was that big an event, if the Hikurangi Trench ruptured, then Wellington wouldn’t be the only place affected. It would be a national emergency,” said Former Wellington mayor Fran Wilde. No road fatality report allowed by police today (Friday), as of posting, despite multiple serious crashes that have been reported locally. ONLY four fatalities reports have been allowed since Saturday’s quintuple road kills. The victims, believed to by Dutch tourists [unconfirmed,] were killed in a head-on crash between a Jucy rental van and an ute on State Highway 1, south of Dunsandel, about 40km south of Christchurch just after 1pm on Thursday. The victims, aged in their mid 20s to early 30s, are said to have arrived in New Zealand about two hours earlier. Driver of the other vehicle has sustained non-life threatening injuries. Gaurav Bhabhera, aged 28, an Indian national, and Marae Judy Dean, aged 52, of Ashburton, driver of the second vehicle involved in the head-on crash were killed. Mr Bhabhera’s wife, Jaina Bhabhera, remained in a critical condition in Christchurch Hospital’s intensive care unit, some three days after the crash. Her fate is currently unknown. Gaurav Bhabhera, aged 28, an Indian national, and Marae Judy Dean, aged 52, of Ashburton, driver of the second vehicle involved in the head-on crash, were killed. Mr Bhabhera’s wife, Jaina Bhabhera, remained in a critical condition in Christchurch Hospital’s intensive care unit, some three days after the crash. Her fate is currently unknown. The previous “death record” was held by a French national, Remi Morilleau, 27, who was killed in a three-car crash in Northland on Christmas Day just hours after arriving in New Zealand. “The tourist’s partner and the driver of another car suffered serious injuries and two children were treated for minor injuries after the crash on State Highway 1 near Whangarei about 6.45pm on Christmas Day,” according to a report. The French couple had been in NZ for about 4 hours, driving just 160km from Auckland airport. About 4,000 overseas visitors, international students, foreign workers and recent emigrants have lost their lives and about 24,000 others seriously injured in New Zealand since January 2000. ONLY one vehicle-related fatality report allowed today, as of posting. The fatality relates to a missing woman after car plunged into water on Saturday. “The body of a woman has been recovered from a car that left the road and went into water off Main Road, Clifton yesterday,” police said. MISSING! When last seen, Kim Bambus was wearing a dark coloured jacket, pink exercise top, black shorts and black and white Nike sneakers. 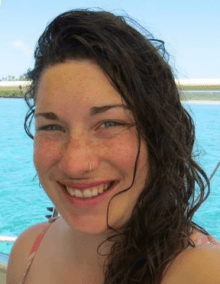 “West Coast Police are still actively looking for missing Leanne Ryall, and appealing for help from the public to find her. “A New Zealand Drug Detection Agency spokesperson said more than 13 percent of its tests in 2016 came back positive for the drug, a 5 percent increase on the previous year.